Willa Robbins is a master tracker working to reintroduce the Mexican wolf, North America's most endangered mammal, to the American Southwest. But when Colorado police recruit her to find her own brother, Zeb, a confessed murderer, she knows skill alone will not sustain her. Willa is thrown back into the past, surfacing memories of a childhood full of intense love, desperate mistakes, and gentle remorse. Trekking through exquisite New Mexico and Colorado landscapes, with Zeb two steps ahead and the police two steps behind, Willa must wrangle her desire to reunite with her brother and her own guilt about their violent past. 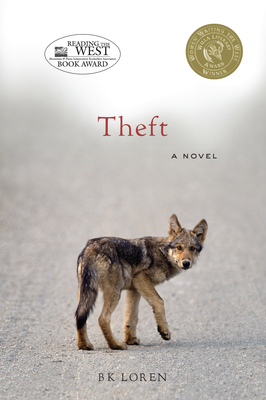 Winner of both the Willa Award and Mountains and Plains Independent Booksellers Award, this debut novel's lyrical prose gives voice to the wildlife and land surrounding these beautifully flawed characters, breathing life into the southwestern terrain. Within this treacherous and mesmerizing landscape, Theft illustrates the struggle to piece together the fragile traces of what has been left behind, allowing for new choices to take shape. This is a story about family, about loss, and about a search for answers. BK Loren has worked as a naturalist, large predator monitor for CO State Parks, professional brainstormer, assistant chef, ranch hand, furniture maker, UPS driver, and college professor. She currently teaches writing at Chatham University's low residency program, the Iowa Summer Writing Festival, and many other venues throughout the United States and Canada. She is a winner of the Mary Roberts-Rinehart National Fellowship and has also received The Dana Award for a novel-in-progress for Theft. Loren currently lives with her partner, two dogs, and two cats in Colorado.